Personal Floatation Devices (PFDs) or more commonly known as Life Vests are wearable or throwable devices designed to help keep a person in the water afloat. The USCG requires vessels carry one PFD for each person onboard. It does not matter what type of craft, or the type of propulsion, each person onboard must have their own PFD. Any craft larger than 16 feet in length (except canoes and kayaks) must have at least one throwable PFD as well. Additionally children less than 13 years of age are required to wear a PFD when above decks. Some states will have a different age limit that will supersede the federal law, so if boating with young children it is best to check with local agencies about what laws may apply. Let’s first look at the basic designs and types of PFDs so we can better understand how each works. Different types of PFDs are designed for different conditions and uses. Understanding the differences will help you in making the right selection for your specific type of boating. Inherently buoyant PFDs: This means the part that keeps you afloat is buoyant without having to be inflated. 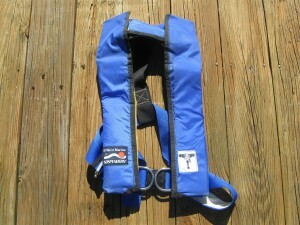 Life vests of this type were originally made using cork and balsa wood blocks. Cork and wood were later replaced with Kapoc. Sealed in vinyl plastic packets, Kapoc is a water resistant natural fiber found in tropical tree pods. The major problem with Kapoc is that the vinyl packets can be punchered, this can lead to the Kapoc material becoming waterlogged greatly reducing bouncy. Kapoc has been replaced in the last 10-20 years with synthetic closed cell foam. Pros: Inexpensive to purchase, require little maintenance, most are USCG approved, very rugged and will function even if damaged. (However damaged units should be replaced as soon as possible.) Good for those who know how to swim as well as non swimmers, approved for water sports such as PWCs and water skiing. They are made in wearable and throwable designs, and come in adult, child and infant sizes. Cons: Bulky and can be uncomfortable to wear, can be hot in the summer. Buoyancy is less than that of inflatable’s. Inflatable PFDs: As the name suggests these inflate with air or CO2. On Sept. 24, 1996 the USCG began approving some inflatable PFDs although not all are USCG approved so check before purchasing. The USCG approval is only valid if you are wearing the PFD therefore you might still want to keep the proper number of the inherently buoyant types onboard to meet minimum USCG requirements. Inflatable’s come in many styles and configurations. Inflation is normally done by pulling a release on the CO2 cartridge they can also be inflated manually with an inflation tube. Some models have a water activated automatic release as well. With the automatic release the vest will inflate after a few seconds in the water. This can be a real asset if the wearer is injured or unconscious. Pros: Less bulky and more comfortable to wear, good in water performance, greater buoyancy than that of the inherently buoyant types. Cons: Higher purchase price, requires regular inspection and rearming to be reliable. Not all are USSCG approved, not approved for children (under 16 years of age), not approved for PWCs and water skiing. Only recommended for those who know how to swim, not considered approved unless worn. Hybrids: These are a combination of the inherently buoyant types and the inflatable’s. They offer the reliability of an inherently buoyant PFD with the additional buoyancy of an inflatable PFD. Pros: Provide initial buoyancy and can have higher deployed buoyancy, reliable, available in adult, youth and child sizes. Recommended for those who know how to swim and non swimmers, some are designed for water sports. Cons: Higher cost, require maintenance, fewer market choices, not considered approved unless worn. Now let’s look at the USCG classifications for use and what they mean to you. All three of the above types can fall into one of the classifications below. Type I: Referred to as the “offshore PFD” it s designed for rough water use and provides the most buoyancy. Designed to turn an unconscious person face up without outside assistance. A good choice for young children, non swimmers, and adults in open water. 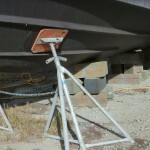 Type II: The most common type found on recreational craft. Better suited to inland and calm waters as it does not have as much buoyancy as a Type I. It is also somewhat less effective than a Type I in turning an unconscious person face-up. Good for small children, infants and non-swimmers as well as adults. Type III: Commonly known as the “sport vests” they are designed for inland waters. Generally not able to turn an unconscious person over without assistance. Considered useful only when rescue is immediate and in calm waters. They come in many styles and types, the most common being the vest used for water skiing and operating PWCs. You can also find type III float coats helpful for use during cold weather boating. They are available in adult, youth and child sizes. Type IV: Are throwable devices not meant to be worn. The most common of this type are the square seat cushions, Ring buoys, and Horseshoe buoys. Designed primarily as a short term life saving device for anyone in the water without a PFD. Note that Type IV PFDs no longer fulfill the personal PFD requirement for vessels under 16′. Type V: Are special-use devices designed for particular water activities. 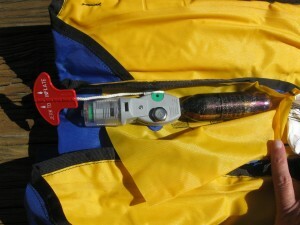 They may be carried in place of another PFD only if used according to the conditions on its label. These include full exposure suits, safety harnesses with a PFD built in, and kayaking vests among others. Floatation requirements are the same or greater than other types of PFDs. 1. Type of waters you will be boating on. 2. The size, weight and age of the persons onboard. 3. The activities you will be doing such as sailing, skiing and so on. 4. The swimming abilities of your passengers. 5. Would a special use PFD add safety for you and your passengers? 6. Special care should be made when selecting PFDs for infants and young children. Once you have picked your PFDs make sure they fit the intended users and that everyone knows how to use them and where they are located. If vests are to be used for sports like water skiing make sure the fit is snug and the vest will not come off if you fall and hit the water at speed. Make sure all passengers know where throwable deceives are. Inherently buoyant PFDs require little maintenance and will last many years if properly cared for. Each PFD should be inspected annually. Check the condition of the straps and buckles as well as the fabric cover. Make sure all the buckles work, the straps are in good condition, and that there are no tears or cuts in the cover. If a PFD is found to be bad it should be disposed of. Before you put it in the dumpster cut it up so that no one else will ever try to use it. If cleaning is needed use a mild detergent with water. Never dry clean, put in a washing machine or dryer. Inflatable PFDs require a bit more care, however they are still fairly easy to maintain. The same visual inspections should be made as with the inherently buoyant type. Additionally the CO2 cylinder and release mechanism should be inspected. The release mechanism will have green indicators for both the manual and automatic releases. If either shows red the units need service. The good news here is the rearming kits are not very expensive running about $25.00 or so and are owner replaceable. Manufactures recommend rearming once every 1-3 years even if the vest has not been used. Additionally It is a good idea to manually inflate the PFD once a year to check for leaks. Extra care needs to be given to Type IV throwable PFDs. In addition to the above checks you should also check for weathering and sun damage as these PFDs are often stored outside for extended periods. Mounting brackets need inspection as well. Often the Ring type has a polypropylene line around the outside and may have a throwing line attached. Polypropylene is used because it floats (making it easier to grab hold of) however it has poor UV resistance and is often the first thing to need attention. As a surveyor one of the biggest problems I see is in improper storage of PFDs. Often they are just thrown into a locker and buried under more “useful” equipment. Many times I find they have not even been removed from the plastic bags they were purchased in. Care should be taken with proper stowage. The PFDs need to be easily accessible, kept dry and not compressed. I often see the use of soft storage cases designed to hold 4 Type II PFDs at a time. Many of these cases use a zipper as the top closure; however the zippers tend to get corroded and cannot be opened. Eight out of ten I check are stuck closed leaving the PFDs inside useless. If you have one of these cases I strongly recommend you stop using it or replace it with the type that uses Velcro for the closure. Label lockers used for stowage with a “Life vests inside” label so that all persons on your boat will know where they are. The above information should help you decide what types of PFDs are best for you and the type of boating you do. I recommend any vessel going out beyond an ocean inlet or into any body of water that can have waves over 1 foot have at least one Type I PFD for each person onboard. Wearing a Type III inflatable PFD when underway is also highly recommended. 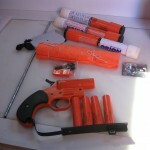 Often it is best to carry several different types for different uses aboard. As PFDs have a pretty good life span compared to some other safety equipment it makes little sense to cut corners and not purchase what you really need. Stow you’re PFDs in accessible well marked dry locations, inspect them at least annually and they will give you many years of peace of mind.